Kyokushin Cup 2014 Open Karate Tournament was concluded on a successful note. Participants from Denmark, Belgium, Ireland and Great Britain participated in the event and Shihan Humberto Budtz(7th Dan) Kyokushinkaikan World SoKyokushin Advisor participated as the Tournament Deliberation committee chairman of the Championship which incidentally was a great strength and honour to all of us. Shihan Lu Eekhau(5th Dan) from Belgium was its Vice chairman. 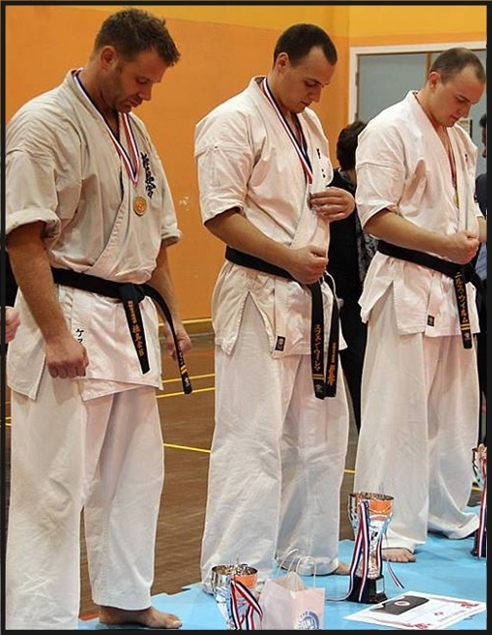 This Championship would be a strong journey forward of Kyokushinkaikan Sokyokushin United Kingdom Branch. In the same way, this Championship would no doubt be a tribute to our late distinguished Karate exponent Sosai Masutatsu Oyama. I also viewed it from another angle as a contribution I bestow on recognised teachers such as pioneers of Kyokushinkaikan Shihan Kazuyuki Hasegawa and Shihan Daigo Oshi. My heartfelt thanks go to Shihan Humberto Budtz, Shihan Lu Eekhau Sensei Stephen McCann, other Instructors, Mr.Jonatahn Mendoza, Nirmala Fernando, Carly Browne, Marion Robertson my beloved members, parents, supporters as well as competitors and all others whose names are not mentioned here for having co-operated with me to make this task a successful one. We would be inviting Europe as well as Japan for the Championship scheduled to be held next year informing that the Kyokushin Cup Open 2015 as an Open Championship to the whole of Britain.